Mountain climbing (or mountaineering) is a hobby where people climb mountains. It may involve hiking, , rock climbing, as well as crossing glaciers. Someone who does mountain climbing is called a mountain climber. Mountain climbers use the strength of their arms and legs to climb up mountains. Many mountain climbers use ropes and wear special shoes and safety equipment. Most mountain climbers go up mountains as a hobby or as a recreational activity. 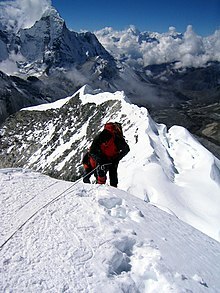 A small number of mountain climbers do mountain climbing as an occupation or job. They get paid by outdoor clothing companies or universities to climb up mountains, or they are hired as a guide by recreational mountain climbers. Climbing mountains can be dangerous; each year, people are seriously injured or even killed from falling, being covered in an avalanche of snow, or getting too cold. To reduce the risks, mountain climbers learn how to climb safely. As well, they wear safety equipment such as helmets and use ropes, compasses, and first aid kits. Mountain climbers in snowy areas who face the danger of being buried in an avalanche of snow also bring other equipment, such as shovels, radio transmitters, and long poles (for finding people who are buried in the snow) and emergency G.P.S .